Last year’s Jago was the fiendishly easy It’s Over Here! with its Tour de France theme, and a a few years before that was the infamous wren. Here we had some answers that needed adjustment before entry and a manhunt to identify at the end. I believe someone wrote in 1ac (an unclued film title, three words) before finishing the preamble. The sadistic part of me hoped they had entered THE INVISIBLE MAN! As expected, the puzzle was straightforward, and it didn’t take long to exclude the ten ladies from the answers. 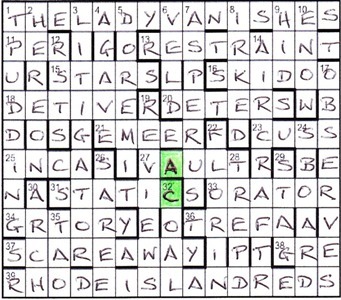 In my case, I was lucky to start on the down clues first, there being no clue to 1ac. Hence, getting 1dn [SUE]T PUDDING followed by 11ac PER[SIAN], I was pretty much home and dry, and THE LADY VANISHES appeared at 1ac before too long. I was a bit hung over when I left the hotel on St David’s Day, so I may have missed any “Agatha Christie stayed here” sign they might have had at reception! As it was, I needed to google “The Old Swan Harrogate” to discover the news about Agatha Christie whose initials were, predictably, in the middle column. This entry was posted on 20 March 2015 at 4:00 pm	and is filed under Solving Blogs. You can follow any responses to this entry through the RSS 2.0 feed. You can leave a response, or trackback from your own site.